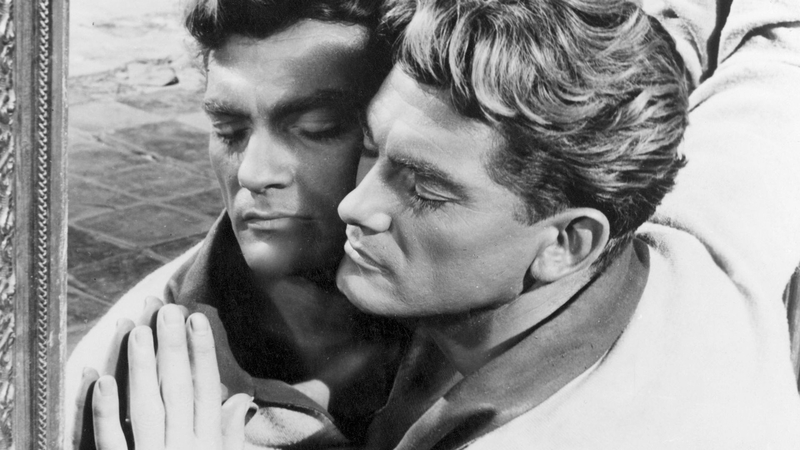 The second film in Jean Cocteau’s Orphic Trilogy, Orphée’s textural and thematic richness is matched only by its enduring technical innovation. A loose adaptation of the Greek myth of Orpheus, Cocteau’s masterpiece uses classical mythic structure and archetypes to explore post-war French rehabilitation and crisis. In this retelling of the myth, the musician Orpheus becomes Orphée the poet (Jean Marais), scratching out a living in 1950 Paris. Cocteau was emphatic that his Orphée should be radically contemporary, reflecting the fashions, habits and struggles of French youth post-1945. The result is a fiercely post-modern text, prefiguring the French New Wave of the 1960s (Jean-Luc Godard among others named Cocteau as a major influence) to express a peculiarly French existential anxiety rising from the rubble of Nazi occupation. For Cocteau, himself accused of collaboration while suffering attacks from the Vichy regime as a decadent artist and homosexual, such an expression was profoundly personal. After rival poet Cégeste (Edouard Demithe) is killed in a bizarre hit and run outside a bar where the two are bickering, Orphée accompanies Cégeste’s girlfriend, the Princess (María Casares) to her mansion, to tend to Cégeste’s body. There, the Princess reveals her true identity as Death, passing through to the Underworld through a mirror, in the first of several increasingly-dazzling magical effects. The eroticism of death is laid bare in Casare’s vampish presence – clad in a tight, black outfit, her hair pulled back in a severe ponytail and sporting dark make up, her captivation of Orphée puts the petit into morte. Death’s allure is contrasted against the bourgeois boredom of Orphée’s domestic life, as he ignores his put-upon, newly-pregnant wife, Eurydice (Marie Déa) in favour of his self-involved navel gazing. One of Cocteau’s additions to the original myth is the inclusion of Heurtebise (François Périer), a recently-deceased man who, now in the service of Death, has fallen in love with Orphée, just as Death has. When Death takes Eurydice to the Underworld, Heurtebise agrees to help Orphée retrieve her in the film’s most visually astonishing sequence shot with noirish expression by master cinematographer Nicolas Hayer. Heurtebise instructs Orphée in how to pass through the mirror into the Underworld, as if the mirror is a pool of water – an effect paid homage to in none other than Sam Raimi’s Evil Dead 2 – before they travel through the “zone”, a passage between the living world and the dead that looks like a bombed-out Paris. The walk through the zone is significant not in its use of back projection – an entirely typical contemporary cinematic technique – but in the way that the dead Heurtebise is ironically the only ‘live’ element in the frame. Meanwhile, Orphée is part of the rear projection, mere steps behind Heurtebise but irretrievably segregated from him. Similarities to the spatially-distorted ‘zone’ in Tarkovsky’s Stalker notwithstanding, the references to the butchered districts of post-occupation European cities is unmistakable. Much has also been made of the zone’s significance for those French accused of Nazi collaboration, particularly in the tribunal scene in which Death herself stands accused of consorting with Orphée. The film’s denouement is deceptively ambivalent, undercutting its own tidiness with a persistent anxiety that resists resolution.